SAO PAULO (CNS) — At the beginning of March, Gisela Gomez, 36, gathered a few belongings, said goodbye to her 17- and 15-year-old sons, and left the region of Monagas in Venezuela, traveling more than 600 miles south to the Brazilian border with her daughters, 3 and 6. In Boa Vista, Gomez’s husband was waiting for them. He had been in Brazil since the beginning of the year and believed that life would be better for his family here. Along with Gomez more than 50,000 Venezuelans have crossed the border into the northern Brazilian state of Roraima, fleeing the political and economic turmoil of their native land. With the greater influx of refugees, however, tension began rising in Brazilian cities and towns near the Venezuelan border. Makeshift camps were set up in town squares, hospitals became overwhelmed, and refugees panhandled on street corners. In February, the Brazilian government, with the help of the U.N. High Commissioner for Refugees, announced a plan to start relocating Venezuelans to other cities in the country. Cities and nongovernmental entities were asked to help take in some of these refugees. Among those able to spare beds was Missao Paz (Peace Mission) in Sao Paulo, a Catholic entity run by the Scalabrini International Migration Network. In the first week of April, the first 23 Venezuelans arrived in Sao Paulo. “They arrived with very few possessions,” Father Parise said. “One carried with him a portable fan, while others had rolled up mattresses as if expecting to sleep on the floor; hardly any of the families had suitcases with them,” he added. All six families had children, the youngest just 3 weeks old. 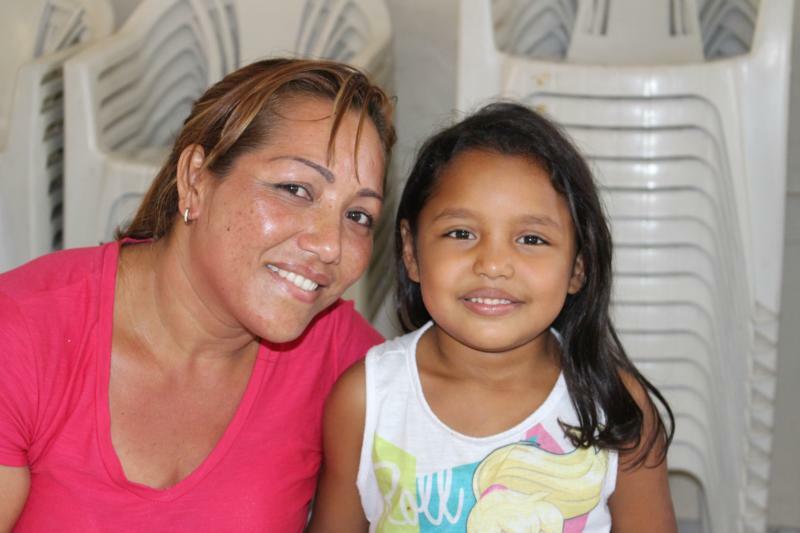 At Missao Paz, these Venezuelans will obtain Brazilian documents, so that they can search for jobs and attend school. The mission also has legal advisers and psychologists for those who seek help. Immersion lectures and Portuguese lessons are given to refugees so they can feel less like an outsider in Latin America’s largest city. “We have currently staying with us Venezuelans, Angolans, Haitians and Togolese,” said Father Parise. He said most refugees stay three to four months, “just long enough” to get a job and find more permanent housing arrangements. In the mission’s recreation room, while two boys entertained themselves with a computer, Gomez was learning a little Portuguese from a 15-year-old Haitian refugee, Rochenerly Joffre, who arrived at the mission with her family late last year. “I can do many things,” said Gomez. “I was a primary school teacher back home, but I also have a hairdresser certificate, and I can even install floor tiles if they want,” she added, trying to sound hopeful. “Back in Venezuela the economic situation is very bad, there was no way we could have stayed,” she said. “Here in Sao Paulo, in less than a week my husband was able to get a waiter’s job in a Peruvian restaurant,” she said, smiling. She said she believes she made the right choice by leaving Venezuela. “Now all I want is for my sons to come and meet us here when they are done with school,” she said, averting the question of whether or not she would go back to Venezuela if the economic and political scenario were to improve. Suddenly, Gomez asked what day of the month it was. Tears swelled up in her eyes as she heard it was April 11.